A Sompting councillor experienced a gruelling seven days sleeping on the streets to raise funds and awareness for Rough Sleeping Action Week. 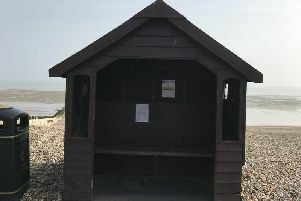 With little more than a sleeping bag and a cardboard box, councillor Paul Mansfield made Shoreham High Street his home during the day and slept underneath the library at night in order to get a better understanding of what homeless people in the area have to face. He said: “It was extremely difficult, especially in the weather we had, there were gale force winds and it was cold. “By day two, I was absolutely starving hungry. I’ve never been so hungry in my life. During the week he said he must have only got about 15 hours sleep in total and survived on donated food – though he did pop back to his home to Sompting once a day to change his underwear. Huddled on the pavement with a cardboard sign, he said it was difficult being ignored by people. Mr Mansfield also gained knowledge of the different shelters available during the winter, which are held at different churches each night. After being referred by the charity Turning Tides, who he raising funds for, Mr Mansfield spent Tuesday at the River of Life Church in Broadwater Road, Thursday at the soup kitchen at St Matthews Church in Tarring Road and Friday at the Salvation Army in Crescent Road. He said the shelters, which had between 30 and 35 people turning up most nights, were ‘absolutely brilliant’ but worried about the provision available for homeless people when the winter period ends. Looking back on the week, he said: “I wanted to throw the towel in after the first day. I was getting really depressed. Speaking to homeless people, he said many of their stories were the same – starting with a family breakup or dependency problem, followed by a period of sofa-surfing until these offers are eventually exhausted. He said he believed a lot of people were in denial about the extent of the problem and how difficult it was for people to break the cycle of homelessness. Click here to donate to Mr Mansfield’s cause and support the charity Turning Tides.